You’re driving your Ram, and you notice that your clutch doesn't feel right. This is frustrating. The clutch should last 100k miles...and it hasn't. Is it time for a clutch replacement already? If you've got a G56 transmission in your Ram, and your truck is going through clutches like kids go through sneakers, this article is for you. How Long Should a G56 Clutch Last? #1 - You've got a Ram with a stock dual mass flywheel + stock clutch. #2 - You've got a Ram with an after-market clutch with a solid flywheel that isn't capable of handling your truck's torque or normal use. Either of these problems can cause your clutch to fail in as little as 15k miles. But if you've got a vehicle with a single mass solid flywheel, and you've got a clutch that's capable of managing your vehicle current engine output and your typical use, your clutch should last a long time. Clutches used on trucks that are "normal" should go over 100k miles. The dual mass flywheel that Ram uses with the G56 transmission is a bad piece of automotive technology. Not only is the damper system too weak for the vehicle (it's barely capable of managing the stock torque of the Cummins), but it quickly fails as soon as power is added. If, for example, you add a diesel engine tuner to your Ram, you'll increase power levels enough that the dual mass flywheel will start to fail. Normally, the damping system allows six degrees of rotation between the primary and secondary flywheel. When the dual mass unit starts to fail, that six degrees jumps up to fifteen, twenty degrees or more. Pretty soon, the dual mass flywheel is destroyed and it's time for a new clutch. Obviously, if you have a Ram truck with a dual mass flywheel, you will want to convert it over to a single mass flywheel. Single mass flywheels last MUCH longer than the dual mass system, and the conversion kit is often less expensive than buying a new dual mass flywheel from the dealer. NOTE: Some companies recommend converting to a double-disc system instead of a single mass flywheel. We think double disc systems are a bad idea for almost all truck owners, and we explain why here. 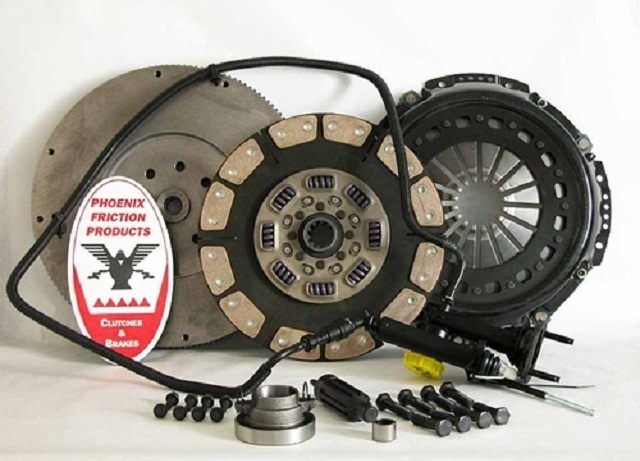 Re: #1: A lot of after-market clutch manufacturers sell inferior quality clutch kits. Our advice when buying a clutch - look for a company that makes and sells clutches for commercial vehicles. If the company sells a clutch disc for medium duty trucks, farm tractors, etc., (like Phoenix Friction), odds are good they know how to make a good clutch. Re: #2: A lot of Ram truck owners upgrade the power output of their trucks, and increased power levels lead to more torque at the flywheel. When the torque exceeds the rating of the clutch disc, the material gets hot. When it gets hot, it starts to wear very quickly. The solution is to buy a clutch that meets or exceeds your truck's power output. We've got a cheat sheet here that will help you estimate your truck's power output level. Then, choose the right stage of clutch kit based on power output. Severe duty towing, such as towing off-road, towing at or above maximum tow capacity, etc. If you're doing one or more of these things, you need a clutch that also exceeds your engine's power output levels. That way, your clutch disc won't get so hot when you're doing what you do. Mileage on the odometer is not an indicator of a clutch that's failing. There are circumstances where the original clutch in a G56 will last in excess 100k miles. There are also situations where the clutch starts to slip at 15k miles. Generally speaking, you want to watch for the warning signs above. If you notice these issues on a consistent basis, it's a good idea to inspect the clutch. If you haven't already converted your dual mass flywheel to a single mass flywheel, you will want to do that ASAP. The dual mass units simply don't last very long, even if your truck is completely stock. Avoid double-disc setups if you can help it. They're expensive, hard to drive, and overkill for 95% of truck owners. Make sure your new clutch disc is matched to your truck's power levels. After-market power adders (like engine tuners, exhausts, downpipes, etc. etc.) increase engine torque, and increased engine torque requires a stronger clutch disc. Make sure your clutch disc meets your vehicle requirements. If you tow daily, tow heavy loads, race, etc., you need an upgrade.